Microsoft announced it's blocking the installation of Windows 10 May 2019 Update on systems with external storage solutions like USB devices or attached SD cards. On a support page, the software giant explains incorrect drive reassignment can occur on these systems. A future Windows 10 build will contain a bug fix. At the moment, there's a simple workaround: disconnect all USB and SD storage devices before installing the update. Note The drive reassignment is not limited to removable drives. Internal hard drives can also be affected. The public release of Windows 10 May 2019 Update is expected to start towards the end of May. Two years ago Microsoft revealed its intention to remove Paint from Windows 10, and move the app to the Windows Store, in favor of the Paint 3D tool. It seems the software giant has changed its opinion as the latest builds of Windows 10 May 2019 Update still have Paint, and no longer have the "Product alert" button that warns the app will soon be moving to the Windows Store. South Korean tech giant Samsung revealed a 133 trillion won ($115 billion) plan to become the world leader in processors by 2030. About 55 percent of the figure is earmarked for research & development, while the remainder will be invested in production capacity. Samsung is already the biggest maker of memory chips and it seems it's now gunning to dethrone Intel. Overall, the announcement is pretty light on details. Samsung Electronics, a world leader in advanced semiconductor technology, today announced that it will invest KRW 133 trillion by 2030 to strengthen its competitiveness in System LSI and Foundry businesses. The investment plan is expected to help the company to reach its goal of becoming the world leader in not only memory semiconductors but also logic chips by 2030. The company also plans to create 15,000 jobs in R&D and production to bolster its technological prowess. The investments through 2030 will be composed of KRW 73 trillion for domestic R&D and KRW 60 trillion for production infrastructure. Per this plan, investments in R&D and facilities for logic semiconductors are expected to amount to an average KRW 11 trillion per year until 2030. 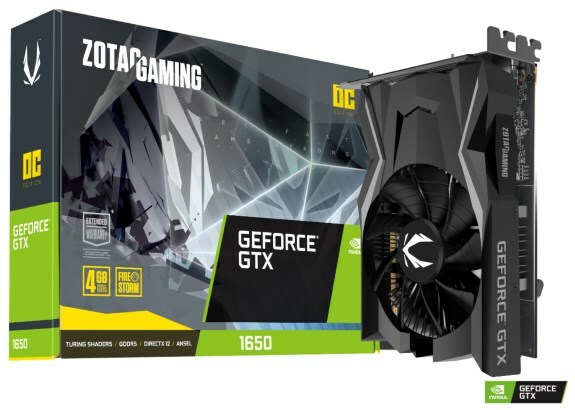 ZOTAC ships a single NVIDIA GeForce GTX 1650 card, the GAMING GeForce GTX 1650 OC. This single-fan model has a compact design, it measures just 151mm. ZOTAC Technology, a global manufacturer of innovation, today announced the ZOTAC GAMING GeForce GTX 1650 OC, the latest addition to the ZOTAC GAMING GeForce® GTX 16-series. Featuring the NVIDIA Turing™ architecture, 4GB GDDR5 memory, and super low power requirements, the ZOTAC GAMING GeForce® GTX 1650 OC is factory overclocked out of the box, supports triple display capability via HDMI 2.0b, DisplayPort 1.4 and Dual Link DVI-D port, and delivers performance that’s up to 2X the GeForce GTX 950 and up to 70% faster than the GTX 1050 on the latest games. The ZOTAC GAMING GeForce GTX 1650 OC measures only 151mm or 5.94 inches and is ready to fit in 99% of systems available. Equipped with a single 90mm fan, the largest our engineers could squeeze in while still conforming to the standard card height. The striped fan blades break the flow of air into smaller channels enabling a more optimized flow and quieter rotation, while the deep angled blade increase downward pressure. A specially designed aluminum sunflower heatsink with direct GPU contact enables a natural even heat distribution from the center core to the outer edges for efficient cooling. Powered only by the PCIe bus means no additional power supply connection needed. Users can just drop the card in their system and secure it down for a simple and clean install. Extract more performance from your graphics card with the downloadable FireStorm utility. With only a few clicks, you can adjust everything from clock speed, memory speed, fan control, fan profile, view GPU stats, and much more. Intel rolls out its 9th Gen Core H-series laptop processors. This lineup include a new mobile flagship called the Core i9-9980HK, this is an eight-core, sixteen-threaded 45W TDP processor with a base clock of 2.4GHz and a 5.0GHz Boost. What's New: Today, Intel launched the most powerful generation of Intel® Core™ mobile processors ever: the new 9th Gen Intel® Core™ mobile H-series processors, designed for gamers and creators who want to push their experience to the next level. Why It's Important: There are 580 million enthusiast PC gamers and 130 million PC-based content creators today1 who care about raw performance as much as they do responsiveness of their PC. They require PCs that can handle everything from demanding AAA games to taxing creative workloads like editing, rendering and transcoding massive 4K video – all while on the go. The 9th Gen Intel Core mobile processors deliver desktop-caliber performance in a mobile form factor and feature amazing performance; the fastest, most reliable wireless with Intel® Wi-Fi 6 AX200 (Gig+); the most versatile wired connectivity with Thunderbolt™ 3; and support for Intel® Optane™ memory technology. Intel Wi-Fi 6 (Gig+) with gigabit Wi-Fi speeds delivering almost three times faster than standard 2x2 AC, and 40% faster than Intel® Wireless-AC (Gigabit). Up to 8 cores and 16 threads, up to 5 GHz maximum turbo frequency, up to 16 MB Intel Smart Cache and up to 40 platform PCIe lanes. NVIDIA rolled out its GeForce 430.39 WHQL drivers, you can grab them over here. This release adds support for the new GeForce GTX 1650, as well as the laptop versions of the GeForce GTX 1660 Ti and GTX 1650. Furthermore, this version adds support for seven more G-Sync Compatible screens, and is the launch driver for Windows 10 May 2019 Update (including Variable Rate Shading). It's also the Game Ready release for Mortal Kombat 11, Anthem, and Strange Brigade. 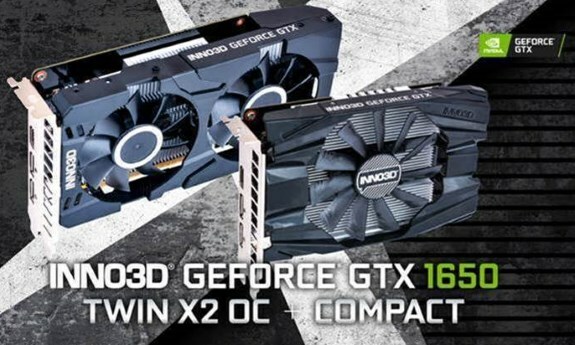 Inno3D send over word about its two new GeForce GTX 1650 models. The firm has a version with its dual-fan TWIN X2 OC cooler as well as a Compact edition. INNO3D, a leading manufacturer of pioneering high-end multimedia components and various innovations is excited to announce the new Supercharger INNO3D GeForce® GTX 1650 TWIN X2 OC and COMPACT. INNO3D has to date released different versions of NVIDIA’s Turing™ architecture such as the INNO3D GeForce RTX 2080 Ti, RTX 2060 and the latest releases of the GeForce GTX 1660 Ti and GTX 1660 - the GTX 1650 TWIN X2 OC and COMPACT adopts the same award-winning ‘Best-in-Class’ NVIDIA’s Turing™ architecture. The INNO3D GeForce GTX 1650 TWIN X2 OC + COMPACT is a no-brainer when considering upgrading your PC for performances that’s up to 2x the GeForce GTX 950 and up to 70% faster than the GTX 1050 on the latest titles. The GTX 1650 is the most ideal upgrade for entry-level gamers who are looking for a fast yet quiet and power-efficient option to play their favourite games. The new shading advancements improve performance, enhance image quality and deliver new levels of geometric complexity while a new unified memory architecture with twice the cache of its predecessor allows for better performance on complex modern games. Our Senior Product Manager Ken Wong commented “NVIDIA has revealed just about every possible implementation of its Turing architecture now, from the extreme GeForce RTX 2080 Ti through the more reasonable RTX 2060, and more recently with the GTX 1660 Ti and GTX 1660 where the RT and Tensor cores (for ray tracing and deep learning, respectively) got axed in favour of lower prices. But there's still one untapped market remaining: the budget sector, and the INNO3D GeForce GTX 1650 TWIN X2 OC and COMPACT will fill that niche. MSI send over details about its GeForce GTX 1650 lineup. The company offers several models, including a version with its TWIN FROZR 7 cooler as well as a compact ITX model. The press release from MSI reveals the GeForce GTX 1650 VENTUS XS 4G OC and	GeForce GTX 1650 AERO ITX 4G OC feature a 1740MHz core clockspeed, while the GeForce GTX 1650 GAMING X 4G is overclocked to 1860MHz. Adored by gamers and hardware enthusiasts alike, a custom version of the iconic TWIN FROZR 7 thermal design adorns the MSI GeForce® GTX 1650 GAMING series. Featuring two of MSI’s patented TORX 3.0 fans, the unique fan design combines the advantages of two differently shaped fan blades to generate huge amounts of airflow. The new trims on the traditional fan blades create concentrated airflow for higher air pressure while also reducing noise. The customized heatsink is designed for efficient heat dissipation to keep the temperature low and performance high. An aggressive gunmetal grey & black look emphasizes the glorious LED glow that is fused into the design. Using the updated & improved MSI Dragon Center software, controlling and syncing your LED-lit components is easier than ever. Dressed in a fashionable black & silver design with industrial style shapes, the MSI GeForce® GTX 1650 VENTUS XS 4G OC is a smaller version of the popular VENTUS design. The new dual-fan thermal design also employs custom fans, providing more airflow and air pressure for enhanced cooling performance. Using a direct contact design, the heatsink transfers heat from the GPU quickly and efficiently. Measuring in at max 170mm length, the GTX 1650 AERO ITX models are small in size but offer full size performance like their bigger brothers. Matching perfectly with the new Z390I GAMING EDGE AC motherboard, this makes them ideal for small form factor gaming systems and HTPC’s. The AERO ITX model utilizes a single high-performance fan on a compact heatsink featuring efficient heatpipes and optimized dissipation. All of this is covered by a very classy looking black and white shroud with carbon details. Even in a small form factor, staying as silent as possible is important. NVIDIA announced the availability of gaming laptops with its GeForce GTX 1650 and GeForce GTX 1660 Ti video cards. Over 80 models are on the way, with prices starting at $799. 2019 NVIDIA today introduced the GeForce® GTX® 1660 Ti and 1650 Turing-based GPUs for gaming laptops, which deliver a major jump in overall performance and power efficiency for today’s most popular games. Beginning today, the world’s top gaming laptop manufacturers are rolling out more than 80 models powered by the latest GeForce GPUs, starting at $799. Laptop owners, who typically upgrade after about four years of use, can see enormous performance gains with the newest GeForce GPUs. GeForce GTX 1660 Ti laptop configurations, for example, use the latest technologies to deliver up to 4x the performance for gaming compared with the four-year-old GeForce GTX 960M. Additionally, gamers can play at 100 frames per second at 1080p in popular games such as Fortnite, PUBG and Apex Legends. GeForce GTX 16-series gaming laptops take advantage of all of the shader innovations in the 12th generation NVIDIA Turing™ GPU architecture, including concurrent floating point and integer operations, unified cache architecture with 3x the L1 cache compared to the Pascal generation, and turbocharged performance using adaptive shading technology. The Turing architecture delivers 1.5x instructions per clock and 1.4x power efficiency of its predecessor, NVIDIA Pascal™, which previously set the standard for power-efficient GPUs. As a result, with a power envelope of as low as 60W, GTX 1660 Ti laptops deliver the best performance per watt of any laptop in their class. GeForce GTX 1660 Ti and 1650 models are available starting today from the world’s top OEMs, including Acer, ASUS, Dell and Alienware, Gigabyte, HP, Lenovo and MSI, and Samsung in the coming months. They will also be available from local OEMs and system builders, including Aftershock, CyberPower PC, Hasee, Maingear, Mechrevo, Mouse, Origin PC, PC Specialist, Sager, Scan, Schenker, Terrans Force and Thunderobot. Pricing, configurations and availability may vary among regions and partners. For a limited time, gamers will receive 2,000 V-Bucks and the Fortnite Counterattack Set with a qualifying purchase of a GeForce 16-series graphics card, desktop or laptop. This promotion is available in most regions around the world. More information is available at https://www.nvidia.com/en-us/geforce/campaigns/fortnite-bundle/.